John Muir said: "Go to the mountains and get their good tidings." Occasionally their tidings are bad. Saturday morning, 12 engineering students in Grenoble got up unspeakably early to catch a bus into the Chartreuse mountains. 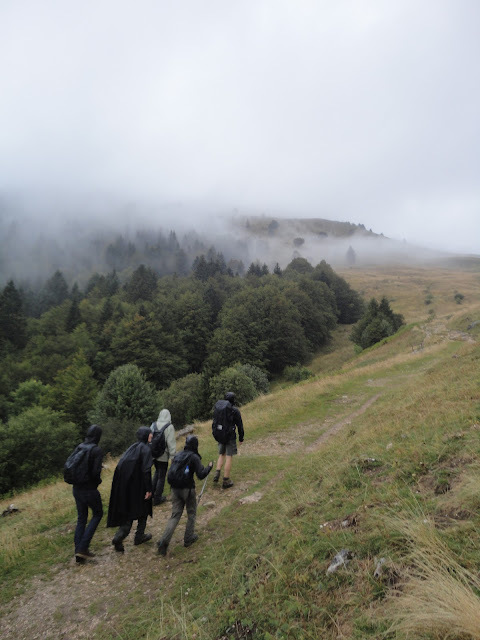 Our objective was Dent de Crolles, the second highest peak in the Chartreuse range, 20 meters lower than Chamchaude, the song of which has already been sung. Our group constituted the entire population of the bus, and the sleepy quiet of early morning slowly dissolved as the sun rose and introductions were made. A half hour later we were standing by the side of a road in the middle of nowhere, Dent de Crolles towering above us. We heading up the trail, and 5 minutes later I felt the first rain drop. "It's probably just a little shower," I thought, not wanting to stop to put on my rain coat. Fifteen minutes later it was pouring, and everyone had their rain coat on. We continued on up through the trees, and the trail just kept getting muddier and more slippery. Above the trees, the mountain had disappeared into the fog. At Col de Coq, the decision was made to not head for the summit. Apparently there are some slippery, rocky passages that were too sketchy with a large group. So we headed down towards the valley on the other side to look for a hut on the map where we could wait out the weather and then catch the early afternoon bus. 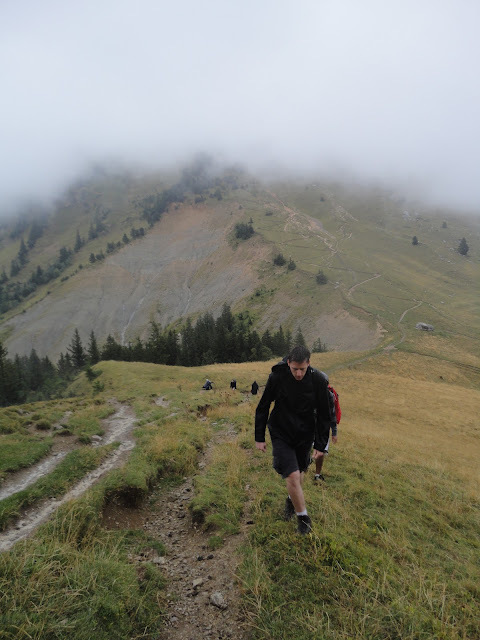 Headed up the hill from Col de Coq, Dent de Crolles in the clouds in the background. From then on out it was basically wet and cold for a while. But sort of beautiful, because the bad weather slowly began to pass, affording us views of the surrounding landscape. The mountains start to appear. The hut we headed too was a cope out - it was looked, and surrounded by sheep poop and the sheep who produced said bundles of joy. Some of the boys kept themselves warm by herding the sheep. Unfortunately I didn't get any pictures because my fingers were really cold and I had big gloves on. You may, if you wish, entertain yourself by imagining grown men chasing sheep around a pasture. Chamchaud appears across the valley. The further we went down the mountain, the better the weather got. You can imagine how frustrating this is - now it's going to clear off?! 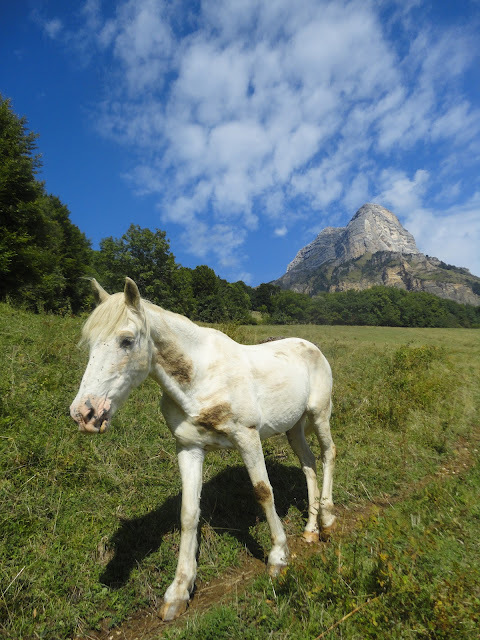 We blew off the last 45 minutes before the bus came in a pasture above the road, where horses frisked in the sunlight and the summit of Dent de Crolles winked at us cheerily from above. This horse just had a nice roll on its back. Hilarious. All I can say is: Dent de Crolles, I'll be back! Bonus! Nutella tip of the week: use slices of apple as spoons to deliver Nutella to your mouth - it's almost fondue. Saturday morning ... Have you been to the Coupe Icare ? On the following day, I woke up early to paraglide from Dent de Crolles. I thought I was the only one who had such an idea, but there was at least 50 others paragliders ! We walked down because it was too windy. Anyway, Dent de Crolles : I'll be back as well !